I spotted a woman on 86th Street in Brooklyn on Sunday with two visible tattoos. She had an intricate piece on the back of her shoulder, but she was wearing a lace shirt that would have required removal for me to get the photo. This picture above, however, was on her left bicep, and she was kind enough to let me snap a picture. Some people can talk for hours about their ink, and some don't say anything. She gave me an approximate location of the shop where she had this done, 20th Avenue and 71st Street, which is very close to Kings County Tattoo Company, so I will make an educated guess and credit them for this piece. When I asked the woman what was the significance of the phrase "Because I said so," she just looked at me with a sly expression and said it was a message "for my husband". 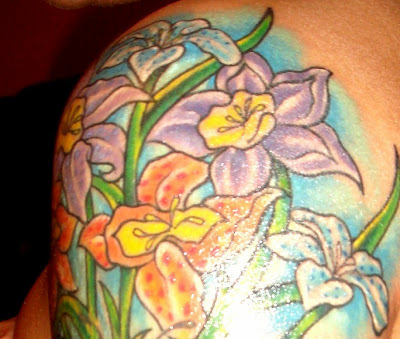 To see other work from Kings County Tattoo Company that has appeared on Tattoosday, click here. Last Tuesday, I met Jessica outside of Madison Square Garden before a Pearl Jam concert. I posted a few of her 49 tattoos here. 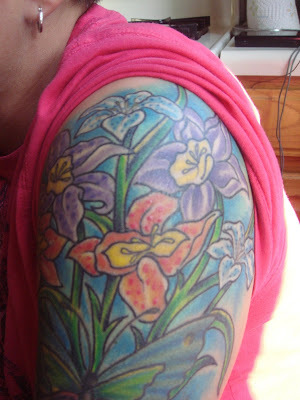 Since then, we have exchanged e-mails, and I have updated the previous post, which now includes a link to her MySpace page (and photos of ALL her ink). 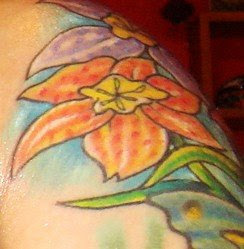 But for the purposes of Tattoosday, I am posting photos of three more pieces. She told me "If I had had a tank top on ya coulda taken pics of my two favorite tattoos". First, at the top of this page, is one of the seven crows she has inked. 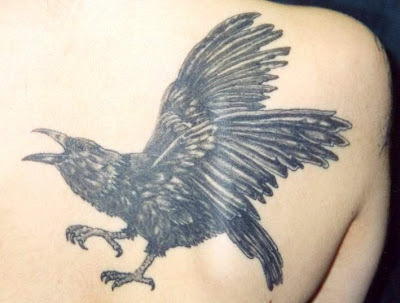 This is on the right side of her back and is called "Caw Caw Bird". The artist is Thomi Hawk from K&B Tattooing in Hightstown, NJ. The second crow she sent me is on her left side, near her collar bone. 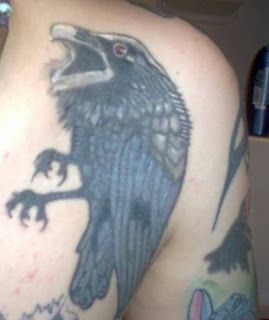 She calls this "Hiya Kung Fu Karate Chop Crow" and she inked it herself, using a mirror. Quite impressive. 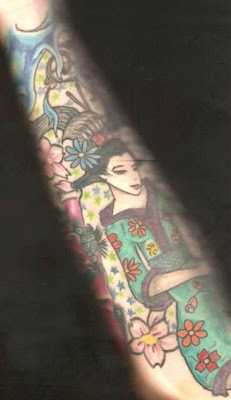 And finally, I featured a "sliver" of a sleeve on her right forearm. This is one of the finer pieces she has (that I personally observed). She passed it on for our appreciation here. They are her geisha and foo dogs. Thanks to Jessica for sharing her ink here at Tattoosday. Remember, you can see all of her tattoos over at her MySpace page. We're hoping she'll let us know when she gets tattoo number fifty! My wife, Melanie, in the course of her daily travels, has the chance to speak with lots of people. Occasionally, they will talk tattoos, and she often promotes Tattoosday by handing out fliers to The Inked. One such acquaintance is Fabiana, who has a whole of slew of tattoos. She has viewed Tattoosday, and has sent me multiple photos of her work. The above detail is from a piece on her upper left arm. Fabiana gets her work done at Third Eye Tattoo in Brooklyn. 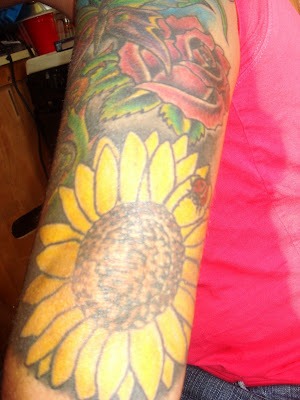 This piece consists of a butterfly, a rose, a sunflower, and some other flowers. "The flowers I just got about 1 month ago are Lilies! I love lilies. They are so beautiful! They are my fav! Purple is my favorite color and orange is my girlfriend's...so I got purple and orange for her! Underneath that is my butterfly! That tat was actually from about 6 years ago when I was with a different girl....we decided one day to get matching tats! NOT a good idea, she broke my heart! So I decided after a couple of years to have it covered up! 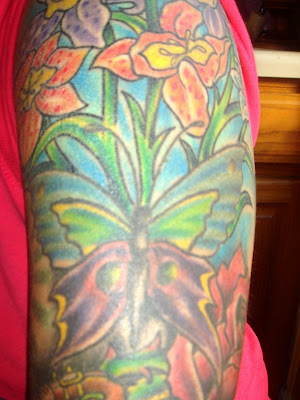 I love butterflies, so my tat guy made it into a big beautiful butterfly, and added a pink rose as well. Under that tat I have my giant sunflower. The sunflower I got for my ex-girlfriend Jill! We were together for 5 and a half years. All throughout our relationship she would call me sunshine...In that sunflower I also have a ladybug, that is for my twin sister... she loves ladybugs so I added one in!" Thanks to Fabiana for sharing her ink here on Tattoosday! Stay tuned for more of her tattoos in the future. There's more to share! Last Friday, I did my civic duty and served jury duty for Kings County Supreme Court. We were assembled and shown a video. They collected our cards and the first group of 30 citizens were called. I was among them. A court officer walked us several blocks to a different building. We passed through the lobby and broke into small groups to enter the elevators up to the 19th floor. In the elevator, I noticed I was standing next to a guy with with sleeves rolled up to mid-forearm. His right arm had an amazing sugar skull tattooed on it. As luck would have it, the tattooed individual sat next to me on a bench outside a courtroom while we waited. And waited. And waited. Fortunately, we had something to talk about: tattoos (with a little surfing thrown in). Chris and I talked for over an hour. Then, we were dismissed. No longer needed. Three hours of jury duty rather than three days. Since my camera had to be checked by security at the main courthouse, Chris walked back with me and let me take a couple of shots of his sugar skull. This tattoo was inked by Adam Hays at Red Rocket Tattoo. There have been many sugar skulls posted here, but this one is among the most intricately done. The detail is phenomenal. Chris, who is heavily inked, values this tattoo because the sugar skull's symbolism reflects the fact that he doesn't like to mourn death. It is a part of the natural cycle of life, and this piece helps him deal with life's problems. "...In my childhood/teenage years, a lot of close friends and family passed away in a short period of time - and yes - I was devastated, but couldn't just tie myself up in the mourning process, because that's what people do - they live and they die. And when I was first introduced to the concept of the sugar skull and it's meaning, [I came to understand] it's really all about embracing the power of death into the fabric of life. The symbolism of the sugar skull to me is kind of a way of transforming the painful 'miseries' of death into a source of nurturing and internal strength. It's a way for me to cherish my fallen dead and a way for their memory to live on in me (or, on me, for that matter). In any case, I feel that it's kind of ingrained in our culture that we need to feel grief and despair when someone dies, but you don't always have to follow the trend. The sugar skull is a way to remember, honor, and feel closer to the dead. And that's what it reminds me of each time I see it." For prior posts with sugar skulls, click here. For prior posts with work from Red Rocket Tattoo, click here. 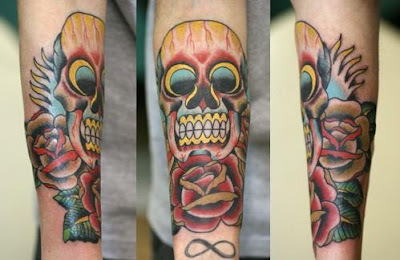 Thanks to Chris for sharing his Sugar Skull tattoo here on Tattoosday! So last night I caught Pearl Jam at Madison Square Garden and, of course, there were tattoos aplenty. But, as I mentioned yesterday, concert-goers generally seem a little more focused on the event at hand than the pursuit of blogfodder by a fellow concert-goer. Luckily for me, Tom was sitting right behind me and I got him to show me his "Stickman" tattoo. 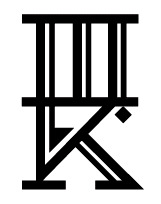 This is one of the band's oldest logos, and is a common piece to get inked by the biggest devotees of the group. Tom had this inked in 1994 at Da Vinci Tattoo Studio in Wantagh, New York. 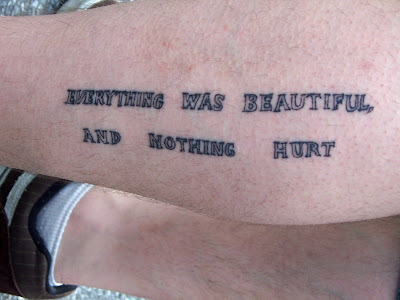 He had yet to see his first Pearl Jam concert when he had this tattooed on his left ankle. Last night was his 14th show (it was my fifth). Thanks to Tom for sharing his Stickman with us! I had it all worked out. Last night was the first night of the Pearl Jam concert at Madison Square Garden. Even though I wasn't going, I would see plenty of ink right next to where I work. 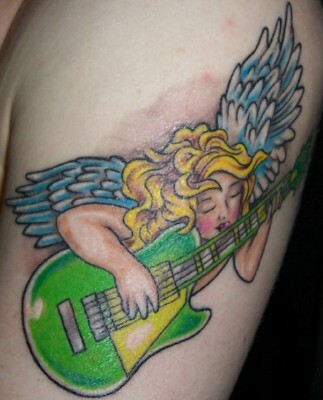 Pearl Jam fans are prolificly tattooed (see this site as proof). What could be easier? One guy didn't want his tattoos photographed. And he was wearing a t-shirt for a tattoo shop on Oregon. In my disappointment, I forgot what it was called. Another guy was in town from Italy to see the band. I think the language barrier was an issue. But I am not generally discouraged. There was, however, a vibe. A general sense that something bigger and better was going on besides indulging the hobby of an almost-41-year old blogger in dire need of a haircut. And of course, they were right. Pearl Jam was returning to the Garden after five years. Really, Tattoosday had to take a back seat to that. But thank goodness for Jessica. She was thoroughly inked and indulged me. Granted, she seemed a little bemused by my exercise and a little disinterested, but she did let me take some photos and gave me cursory explanations. Alas, no Pearl Jam tattoos, but she still had some cool ink. It's on her left wrist and is the autograph of Jonathan Davis, lead singer of Korn. He signed it, and she inked it. Jessica has her own tattoo gun machine, and does some touch-ups and basic line work here and there. Embarassingly, when she said it was Jonathan Davis' autograph, I couldn't connect the name to the face right away and I asked who he was, knowing full well that doing so would make me look like a total dork. And I was right. Of course I knew who he was, I just didn't compute it at the time. She likes crows. She has seven in all. She didn't tell me why the cheetah was significant. If you look at her right arm, you can see a sliver of an amazing piece that I didn't photograph, but should have. 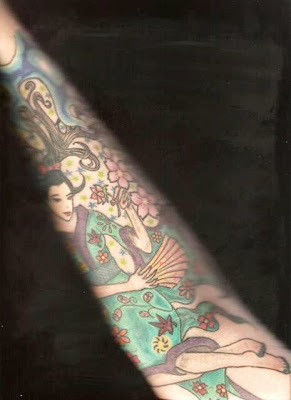 It was amazing piece that encircled her forearm. And here's her upper right arm. That's Pig-Pen from Peanuts, which was one of her nicknames growing up. 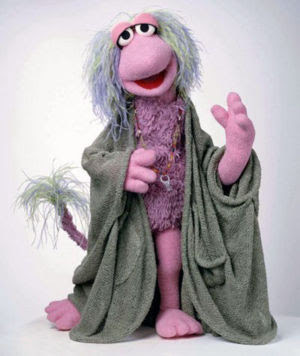 And on the bottom is Mokey, a "primary Fraggle" from Fraggle Rock. Mokey was also one of her nicknames from very early in life. Thanks to Jessica for taking the time to chat with me when so few people seemed interested in sharing. I am celebrating my birthday a week early at the show tonight (Wednesday), so we'll see if any tattoos pop up here on Thursday (or Friday). I've idolized Jonathan Davis from Korn since 1996. To finally meet him was amazing. I always thought I'd be starstruck and lose my composure, but didn't. I held a conversation with him. Wow. How did that happen? A group was forming around the tour bus. He came out...to sign autographs. I told him he was my idol for 12 years, and asked if he could sign my wrist. So he grabbed my wrist. On the outside I was fine, but in my head I turned into a 12-year old boy band fan thinking OMG OMG HE'S TOUCHING ME DON'T FAINT!! The Mokie tattoo, above, was inked by Troy at K & B Tattooing in Hightstown, New Jersey. Rob doesn't show off his ink like a lot of people do. Granted, sharing one's tattoos with the public is part of the appeal for many people. But other folks get tattooed for more personal, private reasons. Many people feel that having a tattoo is in itself, fulfilling. They don't seek recognition to validate their body art. Others do. That's one of the fun things about Tattoosday- when someone shares the personal in this public venue, it is often a fulfillment that has come to fruition. Other times, it's just fun. I recently learned that the husband of one of my wife's old school mates, someone with whom I've talked football and who I see from time to time, is inked. Unfortunately, my camera didn't like the light in the apartment, and I ended up with a lot of blurred or washed out photos. The above two were the best of the bunch. That's part of the reason it took me so long to post. My camera really didn't do justice to the color and craftsmanship of the work. 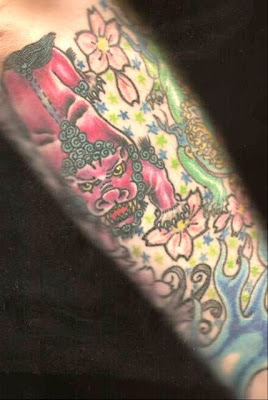 But, as luck would have it, the artist, Horisei, of Chelsea Tattoo Company, had clearer and much better pictures on the shop site. 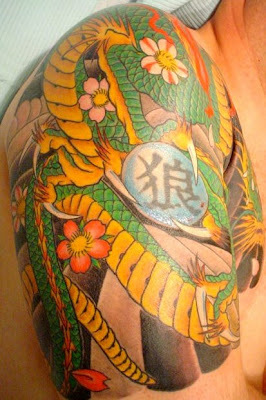 When these were inked, Horisei was part of the staff at Rising Dragon Tattoos. Rising Dragon work has appeared previously here and here. However, Rising Dragon moved to new digs just recently and Horisei stayed in the old location at the new shop, renamed Chelsea Tattoo Company. 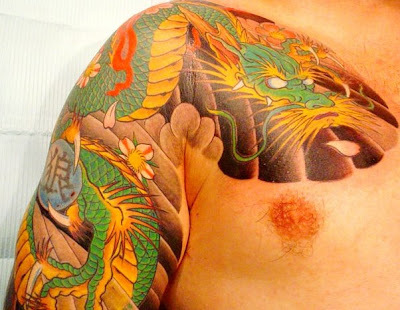 What Rob has are traditional Japanese panels that cover the upper arms, shoulders, and the connecting canvas of the chest corners. Rob's work was done over approximately forty (40!) cumulative hours between March and June of 2007. The only thing that remains to be done is the coloring of the eyes. If you look at the right piece, you'll see a kanji character representing the word "wolf". That part was tattooed 15 years ago, in celebration of Rob's 30th birthday when he was living in San Francisco. And yes, it's an accurate representation of the proper kanji for "wolf". Horisei, a master artist from Yokohama, Japan, was able to incorporate the "wolf" into the design, as it manifests itself in a new context, on a pearl clutched in the grip of a dragon. These two dragons don't "mean" anything, in the traditional sense. A common misconception that people have is that tattoos must mean something. 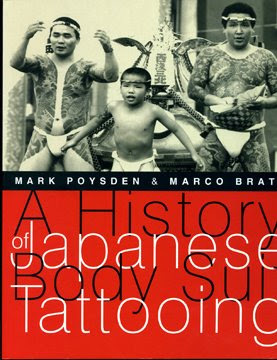 Rather, in Rob's case, they represent an inner appreciation for not just the art of the tattoo, but for traditional Japanese body art. Tattoos don't have to be visible to have purpose. 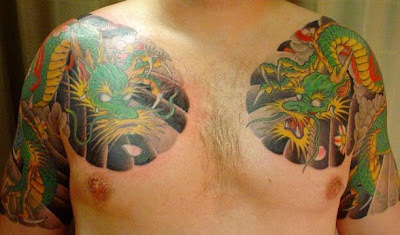 These two dragons reside on Rob's chest and feed his inner strength. It is an honor to have them posted here for the world to see. Thanks to Rob for sharing, and thanks to Horisei and Chelsea Tattoo for the use of their better pictures that allow us here at Tattoosday to fully appreciate the craftsmanship that went into these pieces. These two inner-arm pin-ups belong to local free-lance tattoo artist Peter Caruso. I ran into Peter a couple of Sundays ago, caught without my camera at the local 7-Eleven, so I left him with a flier so he could check out Tattoosday . He did, and e-mailed me shortly thereafter, offering to meet up, take pictures, and talk tattooing. This past Sunday, we reconnected in front of the 7-Eleven and I took a few shots of his awesome tattoos. 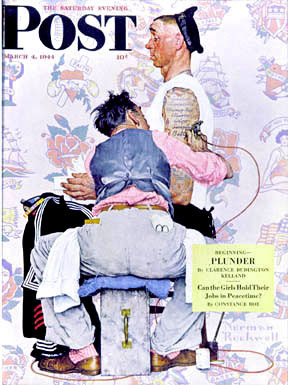 Your standard article on the popularity of tattooing in 2008 always looks back to the old days, back when the only inked folks around (supposedly) were bikers, veterans or sailors, criminals and circus performers. But we are living in an "enlightened" era, says the conventional wisdom, when there is a lot less stigma attached to the art. Tattooing was illegal in New York City from the early 1960's to the mid-1990's. Peter remembers growing up in Bensonhurst and admiring the tattoos of the neighborhood heavies. There was a lot of admiration for the tattooed gangster-types that were the fixtures in the neighborhood delis, hanging out in front of the mom-and-pop stores, and being active in the community. Peter admired the ink, and that old school style has influenced not only his own work, but the work he had done on himself. 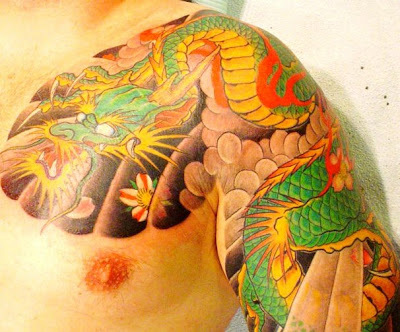 Peter learned from, and was influenced by, those artists he considers to be the "Old School" of Brooklyn tattooists. He worked with and apprenticed under Paul Raffelo of Paulie Tattoo and Vito of Vito Tattoo. He estimates that he has approximately 13 tattoos, including 2 full sleeves. A closer look at the pin-ups on his forearms shows a style of tattoo that is classic old-school. Peter said that this was the type of tattoo that was typical in the old neighborhood he grew up in. The "Steady as She Goes" motto was a standard phrase in a lot of old naval flash art. These pinups were inked by Paulie Tattoos. The mask is used, according to tradition, to drink the blood from the head in an attempt to keep the spirit alive after the body dies. Vito of Vito tattoos was the artist. Peter explained that this represents the thunderbolt that destroys ignorance, a concept explained by the term vajra and a precept in Buddhism that leads to the destruction of ignorance through enlightenment. Thanks to Peter Caruso for sharing his tattoos here on Tattoosday. Peter is currently working free-lance and can be contacted by clicking here. I met Jill outside of Penn Station last week and she had this interesting creature on her left calf. I guessed it was a fairy, and noted (to myself) that it looked like one of the creatures in Lady Cottington's Pressed Fairy Book. 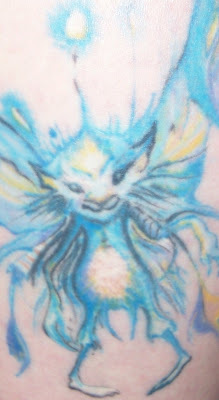 I later learned that this was no coincidence, as the illustrator of said book is Brian Froud, upon whose work this tattoo was based. Jill identified it as a cat fairy, which is supposed to grant protection while one sleeps. She had this inked at a tattoo shop in the Corona section of Queens about 6 years ago. Jill doesn't recall the name of the shop, nor the artist that inked this, one of her six tattoos. Jill deserves a little cross promotion here, as she is a video blogger over at www.xgobobeanx.com. Some of her other tattoos, along with this one, make fleeting appearances in her video posts. Her YouTube channel is here. Thanks to Jill for sharing her fairy here on Tattoosday! Well Matt hat some might awesome work, and this piece just adds to the oeuvre of his canvas. Since El Día de los Muertos [The Day of the Dead] is celebrated November 1 & 2, and Jack was born on November 1, I thought it would be fitting as I mulled over more and more the significance of the first day in the Day of the Dead celebration. The strange part is that the celebration on the first day is meant to honor the deceased infants and small children, whereas the second day is in honor of grown-ups/adults. Also, we've noticed Jack at a super young age responsive to non-existent beings, as if he was communicating or interacting with something that wasn't there. It is said that during the Day of the Dead, it is easier for the departed to visit and communicate with the living. After learning that, and remembering how focused he was as an infant on these things that I really wasn't able to make sense of, it all tied itself together. Since it basically wraps my forearm, it's kind of hard to see how it is bookended by a rose on each side, ocher-shaded, and footnoted by a traditional red rose with okra folds. This was also another piece by Travis Stanley at 713 Tattoo Parlour in Houston, and was tackled as we went along. I enjoy working like that- researching with the artist and maintaining the level of comfort to develop a meaningful piece that sometimes only makes itself apparent after a day or so of life on the body. The bizarre color scheme and the bluish brain matter seen behind the top of the piece, behind the red cracks in the skull, are meant to convey the playfulness of a candy skull, but also to introduce a slight feeling of discomfort or uncertainty when a closer look is taken. Thanks to Mat for sending this along, and giving us a behind-the-scenes perspective of the piece. We can always rely on Mat to get us to look beyond the tattoo and come to a better understanding of the thought process, as well as the creative instincts, that helped craft his body art. It was the swallows on her back that I noticed. But they were covered partially by the straps of her top, so I was just going to give her a Tattoosday flier and go on my merry way. But, Syndy, a first grade teacher visiting from North Carolina, blew me away by peeling up her shirt on the sidewalk in front of Penn Station to reveal this stunning black and gray Polish windjammer. This tattoo was inked in honor of her late grandmother, with the banner inscription "Forever -n- Ever, Nanny". Syndy says her Nanny was a remarkable woman who always encouraged her to "be free," and loved going sailing. This piece was inked in two sittings by Craig Foster at Skinwerks Tattoo & Design in Atlanta. Thanks to Syndy for sharing her beautiful tribute here at Tattoosday! Kurt Vonnegut Remembered. So it goes. Identifying himself only as Soul Thief, his DJ name, this musician seemed slightly reluctant to participate, and wasn't exactly forthcoming about his work. However, he did allow me to take a shot of the above piece, from his left bicep. 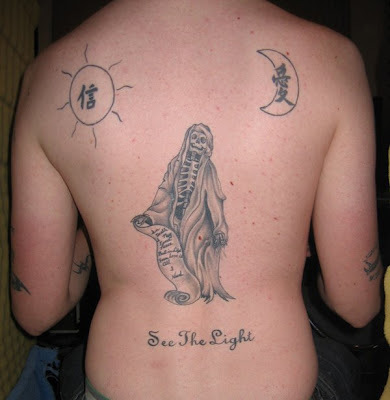 Actually, it's three tattoos, but the focus was on the top piece with the skeletons. The piece consists of two quotes from songs that meant a lot to him at the time of the tattooing. On top is the phrase "Dreams like this must die," which he cited as a lyric from Andy Wood, who I recognized as the late singer from the Seattle band Mother Love Bone. I later realized the song from which the lyric came is the beautiful "Chloe Dancer/Crown of Thorns". 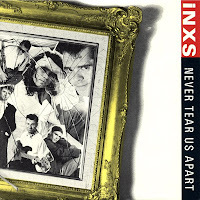 The bottom lyric is "But they'll never tear us apart," which, when he cited Michael Hutchence, I knew to be the words from the INXS hit "Never Tear Us Apart". The piece was inked by Tom Barrier at Raz-a-Tat Tattoo in Bennington, Vermont. Soul Thief indicated that Tom is the only tattoo artist that he ever went back to for a second piece. Tom had also done a back piece, but that he couldn't show me that on the street. When I asked him for any further significance of the skeletons encircling one another in their arms, he was a little elusive, saying that tattoo meanings change, and they are constant reminders of where one has been. I took Soul Thief's level of elusiveness with a grain of salt. He didn't know me from Adam, and not everyone wants to share personal stories with people they just met. Plus, what he said made sense, tattoo meanings do change. "I'm the guy with the skeletons tattoo on my arm. By the way, my name is Nate. 1. The Idea. It's whatever possesses you to do such a thing in the first place. Being struck by a piece of art, having a change or new experience in your life, boredom, etc. 2. The Image. It's whatever you feel in a given time that you HAVE to have permanently scarred into your body. 3. The time and the place. Because tattoos last your entire life they will always be a reminder of where you were and what you felt like when you got them- If you don't remember either of those things, that says something about you too. 4. The Life. Your tattoos live right along side you. As your life goes on, you change and but your tattoos really don't. The only changeable thing is what you infer upon them. This is the part you need to reconcile when you get tattoos- I think of the Norman Rockwell picture of a sailor in a tattoo parlor- you may love whatever it is that's going onto your skin right now, but will you in the future. Are you that committed? For example, the tattoo you photographed today was one that I got when I fell in love with my girlfriend of the last five years. The lyrics were from the music I was listening to at the time and the image just popped into my head us dying in each other's arms. In one way it means something because of the feelings I had at the time and the place when I got it, but in another way it can't mean anything because it means nothing to those outside of me. My tattoo is my life not yours. For everyone else it's something intangible without my explanation or without them projecting their own life experience onto it. 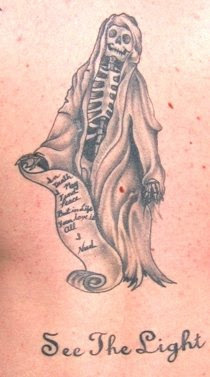 Anyway, before I ramble on too long, I attached a picture of the stuff tattooed on my back in case you're interested. It reminds me that death is sneaking up behind me, so it helps me make the most out of the time that I'm alive. The inscription on the skeleton's scroll reads "In death I may find peace, but in life your love is all I need." I've reprinted Nate's entire e-mail because it is an intelligent, well-crafted expression of the idea of tattoos and why people choose to get ink.